I make! 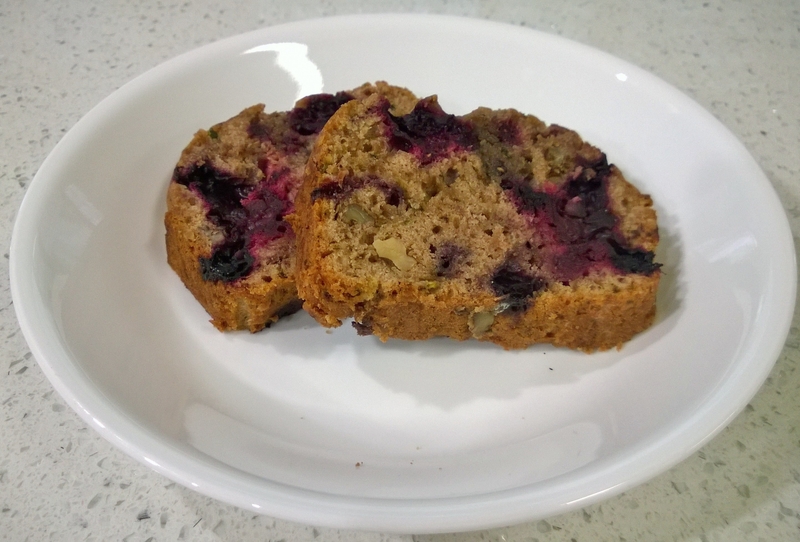 Berry zucchini bread edition | Random moosages as I see fit. I continue to have too much stuff and need to find ways to get rid of it before it spoils. This time, zucchini. I thought it would be a good idea to buy a Costco-sized bag of zucchini. Mind you, it would only be me eating this zucchini and I’m hardly home long enough to cook. So of course, I had this massive amount of zucchini that was starting to go soft and I really needed to get rid of it. And thus I made a whole bunch of berry zucchini bread and foisted that off on people. I made a version of this recipe that I found and it’s pretty good. I had people hoarding slices for breakfast the next morning. I bet it would make really good French toast. Anyway, it’s definitely something I will make again when I have too much zucchini. Preheat oven to 350 degrees F (175 degrees C). Lightly grease loaf pans. In a separate bowl, mix together flour, salt, baking powder, baking soda, nutmeg, and cinnamon. Add 1/3 of the dry ingredients to the wet ingredients and mix until incorporated and then add 1/2 the zucchini and mix until incorporated. Repeat ending with the dry ingredients. Fold in berries and walnuts (if using). Transfer to loaf pans and bake for 70-80 minutes, or until a knife inserted into the center of the loaf comes out clean. Cool 20 minutes in pans, then turn out onto wire racks to cool completely. I might do a mix of granulated and brown sugar next time for a hint of a molassesy flavor. I increased the shredded zucchini to 3c, which is about 2 medium zucchini (you don’t understand, I made A LOT of zucchini bread). I’ve made it with and without the walnuts. I think I prefer the texture with walnuts. I don’t remember how big my loaf pans are, but the recipe yields 2 larger loaves (as opposed to 4 mini-loaves). But I did have to increase my baking time to about 70-80min.